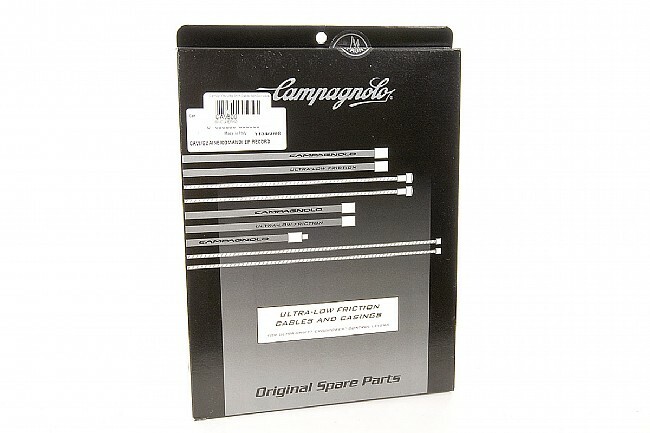 Campagnolo 11-speed systems require a specific 4.1mm shift housing diameter, specialized cables and cable stops. This kit includes everything your need to set up your 11-speed shifters and brakes with low friction cables and housing for smooth, reliable performance. It is also back compatible with 10-speed systems for 2009-present. Campy part # CP-ER600. I always use Campy with Campy. They made the components and they should provide the cables for best results. Smooth shifting and breaking, all the right stuff to do the job. Since I was building up a new frame with a record 11 speed groupo, thought it would only be right to use Campagnolo original cables and housing. nice and smooth shifting as always. Use it to replace my cables and housing. What I find is that I need to change 2 rear detailer cables for one of the others. The price here is the best I found. Missing cable terminations crimps. Missing installation instructions. Campys website only has Italian installation instructions. Missing shifter ferrules. Shifting vs braking housings and cables are not labelled as such on the packaging. All in all, not very user friendly and definitely not complete. Disappointing product, Campy. Thanks for your review! I am sorry to hear you about the trouble you are having with your Cables and housing set from Campagnolo. Be sure to get in touch with our customer service department at [email protected] if we can help you with anything! I love the red housing. The only problem is that the metal end caps didn't seem to fit the shifter cables. I had to reuse the old ones. For Ultra Shift lever bodies, there is no ferrule required on the shift cable. This kit includes all of the required ferrules. It is possible that you have different shifters.